Why Does Google Think I’m Japanese? This has been going on for a while. Maybe they’ve heard of my fascination with Asian women and decided to do me one better. Nah. Probably not. Oh Google, master of the universe, why do you puzzle me so? I am but a middle-aged boy from Connecticut who speaks English and English only. Yet my Gmail account, often as not, displays ads in Japanese. Gotcha–but I still don’t speak Japanese. 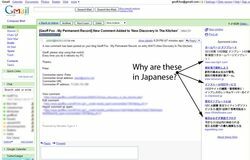 If you can figure out why Google thinks I’m turning Japanese, I’m really turning Jpaanese, they really think so, would you let me know? I’ve also noticed that sometimes the Firefox Tab in the taskbar at the bottom of the page is also in Japanese. This happens even if I’m not in gmail. You are not alone, in having incorrect language ads. My google web search, gmail, blog and everything that is related to google continues to display ads and info in Japanese when I don’t read or understand that language. I have done and re-done the settings. But it appears as if google is hell bent upon teaching me Japanese. My computer at work (suburb of Milwaukee, WI) always thinks I’m in Manchester, CT.
I’ve changed it a couple of times but it always reverts back to Manchester…?? ?